Florida hair surgeon uses hair transplant technique that avoids shaving patient’s hair, leaving signs of procedure unnoticeable to others. 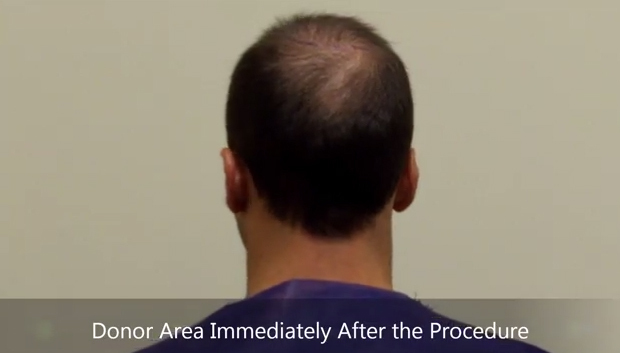 The FUE hair transplant technique produces fantastic hair growth results without a visible linear scar. Now patients can actually leave the procedure without feeling self-conscious about their procedure. Dr. Marco Barusco, a board-certified surgeon with Tempus Hair Restoration, recently developed a new no-shave technique for the follicular unit extraction (FUE) hair transplantation procedure. 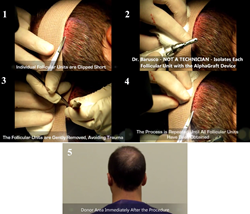 This new technique avoids shaving the patients scalp by manually separating the longer hairs in the back of the head (donor area) and only trimming the hairs to be extracted. Patients leave the office without any signs of a surgical procedure, allowing them significantly less downtime. An FUE hair transplant procedure extracts individual hair follicles and transplants the follicles to designated areas of the scalp where hair loss has occurred. Compared to other hair transplant procedures, the FUE hair transplant is less invasive and minimizes visible scarring, a significant benefit. Traditionally, the scalp is shaved out of convenience to allow the hair transplant surgeon to see the angle of the hair follicles being transplanted. In many cases, patients have to wait until their hair has grown back to resume activities. With the no-shave technique, Dr. Barusco is only trimming the hairs that will be transplanted, allowing the normal hair length to easily cover the tiny 0.8mm. incisions. For women, who tend to have longer hair, shaving the scalp can be even more dramatic and upsetting, making the no-shave technique a desirable option. Dr. Barusco has been specializing in hair restoration surgery for the past 16 years and practices at the largest hair restoration practices in Florida, Tempus Hair Restoration. He was recently appointed to the University of Central Florida College of Medicine faculty as Assistant Professor of Surgery.